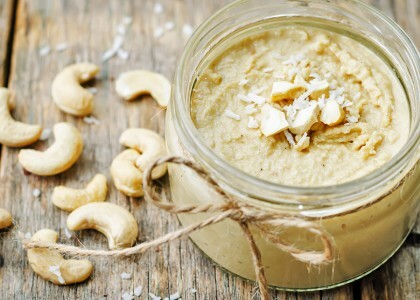 Homemade Cashew Nut Butter is a delicious alternative to peanut butter and is a good way to receive cashew healthy benefits. 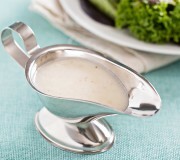 Natural cashew butter has no additives or preservatives and can be made right in your own kitchen. 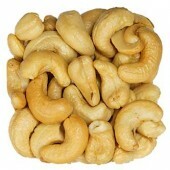 The Eatnuts.com Cashews can be used at this point for cashew butter or can be ground into flour, or can be eaten by the handful. 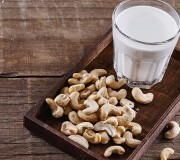 Place the prepared cashews in a food processor or Vitamix machine along with salt, oil and honey. Blend in machine for approximately 10 minutes. Use a spatula as needed to push the cashew butter to the blade (with the machine turned off), then continue to blend until the cashew butter is creamy. The blend of the creamy roasted cashews leaves you with a creamy, slightly sweet nut butter that can be paired with many foods such as cheese, fruit, crackers, spreads, sandwiches and more. 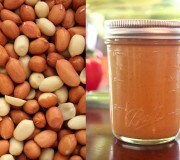 A quick, simple, and all natural homemade peanut butter. Customize however you'd like, even incorporate other nuts for a delicious and unique nut butter your family will love.